PURPOSE: Mild swelling of astrocytes is proposed as a key event in the pathogenesis of hepatic encephalopathy. Proton MR spectroscopy (1H-MR spectroscopy), diffusion-weighted imaging (DWI), and magnetization transfer imaging were performed in patients with alcoholic and nonalcoholic liver cirrhosis and correlated with different clinical stages of hepatic encephalopathy to assess alterations in cerebral water metabolism in different subgroups of patients with cirrhosis. MATERIAL AND METHODS: Forty-five patients (26 alcoholics, 19 nonalcoholics [due to hepatitis C (n = 9), hemochromatosis (n = 2), primary chronic cholangitis (n = 2), hepatitis B (n = 1), Wilson disease (n = 1), cryptogenic cirrhosis (n = 4)]) and 18 controls underwent 1H-MR spectroscopy, magnetization transfer imaging, and DWI of the basal ganglia and normally appearing occipital white matter (NAWM). N-acetylaspartate (NAA), choline (Cho), myo-inositol (mIns), and glutamine/glutamate (Glx) relative to creatine (Cr), the apparent diffusion coefficients (ADC), and the magnetization transfer ratios (MTR) were correlated to the neuropsychologic status, which was assessed by computerized psychometry and mental state grading, according to the West Haven criteria. RESULTS: Compared with controls, nonalcoholic subjects exhibited a gradual increase of Glx/Cr in the basal ganglia and NAWM; a decrease in mIns/Cr; a significant decrease of MTR in the thalamus, the putamen, the pallidum, and NAWM; and an increase in the ADC of the NAWM with increasing hepatic encephalopathy severity. In alcoholics, mIns/Cr of the basal ganglia and the NAWM, Cho/Cr of the basal ganglia, and MTR of all assessed regions were decreased. Glx/Cr of the basal ganglia and of the NAWM was increased, compared with that of controls; but no correlation to the clinical hepatic encephalopathy grading was found. ADC did not change significantly between the groups. CONCLUSIONS: Apart from a typical pattern of 1H-MR spectroscopy alterations in hepatic encephalopathy, a gradual decrease in MTR and an increase of ADC was found correlating to clinical grading of hepatic encephalopathy in nonalcoholic patients with cirrhosis. In alcoholic patients with hepatic encephalopathy, there was no such correlation. Abnormalities detected by MR imaging may hint at different pathways of brain damage in alcohol-induced liver disease. Mild swelling of astrocytes is proposed as a key event in the pathogenesis of hepatic encephalopathy.1 Proton MR spectroscopy (1H-MR spectroscopy) studies in patients with liver cirrhosis almost uniformly show a decrease in the ratio of choline to creatine (Cho/Cr), a decrease in myo-inositol (mIns/Cr), and an elevation in cerebral glutamine and creatine (Glx/Cr) signal intensity.2–7 Astrocytic glutamine accumulation due to ammonia, other neurotoxins, and oxidative/nitrosative stress with reactive depletion of the osmosensitive mIns and other osmolite pools is a widely accepted interpretation of these findings.8–10 In the present study, 1H-MR spectroscopy was performed to test whether the well-investigated spectroscopic alterations in hepatic encephalopathy can be found in both subgroups of patients with alcoholic and nonalcoholic subtypes of cirrhosis. Magnetization transfer contrast imaging has shown a decrease of the magnetization transfer ratio (MTR) in normal-appearing white matter (NAWM) and normal-appearing gray matter regions in patients with cirrhosis with manifest hepatic encephalopathy.11,12 Reversibility after successful liver transplantation was interpreted as an indicator of increased free cerebral water, thus supporting the hypothesis of mild astrocyte swelling as a major pathogenetic event in hepatic encephalopathy.13 We performed magnetization transfer imaging in both subgroups of patients with cirrhosis to test whether alterations of magnetization transfer are present in alcoholic as well as in nonalcoholic patients with cirrhosis. The first study using diffusion-weighted imaging (DWI) in hepatic encephalopathy showed an increase of the apparent diffusion coefficient (ADC) in NAWM and in the basal ganglia except in the thalamus in nonalcoholic patients with cirrhosis, a finding reported to indicate an ammonia-induced increase in brain-water mobility and content.14 In this article, ADC was determined as a means to differentiate intracellular and extracellular edema. A direct measurement of absolute brain-water content was not performed. Although various imaging findings have been described in patients with alcoholic liver cirrhosis, to our knowledge, no data on magnetization transfer imaging and DWI have been published for this specific subgroup and the nonalcoholic subtype of cirrhosis. Furthermore, imaging findings in different degrees of hepatic encephalopathy defined by computer psychometry have not been analyzed previously. Therefore, this investigation was performed to test whether 1H-MR spectroscopy, magnetization transfer imaging, and DWI can demonstrate alterations associated with increasing severity of hepatic encephalopathy and whether these alterations affect both white and gray matter. Furthermore, we investigated whether alterations can be found in both alcoholic and nonalcoholic patients with liver cirrhosis. Forty-five patients with cirrhosis and 18 age-matched controls were included in the study (Table 1). All patients and volunteers gave written informed consent. Cirrhosis was due to alcohol abuse in 26 patients. Alcohol abuse was diagnosed clinically and on the basis of a history of a regular intake of more than 3 units of alcohol per day on a regular basis in the absence of another etiologic factor of liver cirrhosis, particular viral hepatitis. Other causes like hepatitis B or C, primary biliary cirrhosis, or a combination of them were found in 19 patients. The control group consisted of 8 men and 10 women; the alcohol-positive cirrhotic group, of 18 men and 8 women; and the alcohol-negative cirrhotic group, of 14 men and 5 women. All alcoholics were abstinent during the study phase. Subjects with a history of drug abuse with neurologic or psychiatric diseases were excluded from the study. In addition, patients treated with central nervous system (CNS)–relevant medications such as benzodiazepines, benzodiazepine antagonists, antidepressants, etc were excluded from the study. Severe disease such as spontaneous bacterial peritonitis, decompensated renal insufficiency, decompensated diabetes mellitus, or coronary heart diseases were further exclusion criteria. Patients with higher degrees of hepatic encephalopathy were excluded from the investigations, because asterixis, hyperreflexia, and other more severe stages such as stupor or somnolence did not allow safe and artifact-free MR imaging. The severity of liver disease was determined according to the Child-Pugh score.15 Alcoholics were graded Child-Pugh A in 10 patients, Child-Pugh B in 11 patients, Child-Pugh C in 5; nonalcoholics were graded Child-Pugh A in 9 patients, Child-Pugh B in 5, and Child-Pugh C in 5 (Table 1). Five computer psychometric neurologic tests were performed on each patient. The test battery included the Visual Pursuit Test, Motor Performance Series, Cognitrone, Vienna Reaction Test, and the Tachistoscopic Traffic Perception Test Mannheim for screen as part of the Vienna Test System.16 Minimal hepatic encephalopathy was diagnosed if a patient showed no clinical overt symptoms of hepatic encephalopathy and performed <1 standard deviation (SD) below the mean in at least 2 of the 5 computer psychometric tests of the test battery.17 Other patients with cirrhosis without clinical overt hepatic encephalopathy performing below −1 SD in only 1 of the tests were graded HE 0.17 Overt encephalopathy was graded according to the West Haven criteria.18 Alcoholics were graded HE 0 (no hepatic encephalopathy) in 7 patients, minimal hepatic encephalopathy (mHE) in 8 patients, HE 1 in 5 patients, and HE 1 in 6. Nonalcoholics were graded HE 0 in 5 patients, mHE in 3, HE 1 in 6, and HE 2 in 5 patients (Table 1). MR imaging was performed on a 1.5T clinical scanner (Magnetom Vision Plus, Siemens Medical Solutions, Erlangen, Germany) by using the standard head coil. Total examination time was approximately 40 minutes per subject. Single-voxel proton spectra were obtained from a volume of interest located in the white matter of the left occipital lobe and a second volume of interest located in the left basal ganglia, to assess both white matter and gray matter alterations. Volume size was a cube of 20 × 20 × 20 mm. Voxel size was kept constant for all examinations. Before recording the spectra, we optimized homogeneity of the magnetic field by shimming until a line width of the water signal intensity below 10 Hz was obtained. Water suppression was accomplished by using a frequency-selective prepulse on the water resonance. The spectra were obtained by using a single-volume spectroscopy-stimulated echo-acquisition method with short TE (TR/TE, 1500/20 ms; 128 acquisitions). Spectrum analysis was performed off-line on an external workstation by means of the LCModel (version 5.2–2) and LCMgui (version 1.1–0) software (S.K. Provencher, Canada). The process of determining peak intensities of the different metabolites is described in detail elsewhere.19 Relative concentrations of NAA, Glx, Cho, mIns, and the Cr resonance were used to calculate metabolite ratios with respect to the Cr resonance. In 8 controls, 2 alcoholics, and 1 nonalcoholic patient, lengthy imaging times were not tolerated and MR spectroscopy could not be performed. 1) where S0 is the mean signal intensity for a particular region obtained from the sequence without the saturation pulse and SS is the mean signal intensity with the saturation pulse. The mean MTRs were determined in regions of interest manually drawn by 1 examiner (F.M. ), placed in the thalamus, the globus pallidus, the putamen, the caudate head, occipital white matter (each reported as a mean of right and left), and the pons. Region-of-interest size was kept constant for all regions within 1 patient, with a minimum of 30 pixels not exceeding 300 pixels. Evaluation was performed by using a noncommercial software that automatically computes MTR pixel by pixel from the original imaging files. Gray values in these secondary images represent MTR data. 2) By calculating the mean of the 3 directions, we generated the ADC trace map. The mean ADC was determined in manually drawn regions of interest placed in the thalamus, occipital white matter (reported as the mean of right and left), and the pons. Regions of interest were placed by 1 examiner (F.M.) and were positioned in identical areas for MTR and MR spectroscopy. Statistical analysis was conducted by using SPSS software (version 10.1.3, Statistical Package for the Social Sciences, Chicago, Ill). Results of different groups were compared by using the nonparametric Mann-Whitney U test, assuming significance at a level of P < .05. Spearman rank correlation was used to calculate correlation coefficients. In the nonalcoholic group, mIns/Cr and Cho/Cr of the basal ganglia were significantly reduced, compared with those of the controls, whereas Glx/Cr was increased. mIns/Cr of the NAWM was significantly reduced, NAA/Cr was slightly increased, and Glx/Cr was strongly increased (Fig 1). Hepatic encephalopathy severity correlated negatively with the mIns/Cr in the basal ganglia (r = −0.56; P < .016; Spearman rank correlation) and in the NAWM (r = −0.53; P < .024; Spearman rank correlation). A positive correlation was found between Glx/Cr of the basal ganglia and the NAWM with hepatic encephalopathy severity and between the NAA/Cr of the white matter voxel and hepatic encephalopathy severity (Table 2). Graph shows hepatic encephalopathy grading and occipital white matter Glx/Cr in mean values; whiskers show SD. 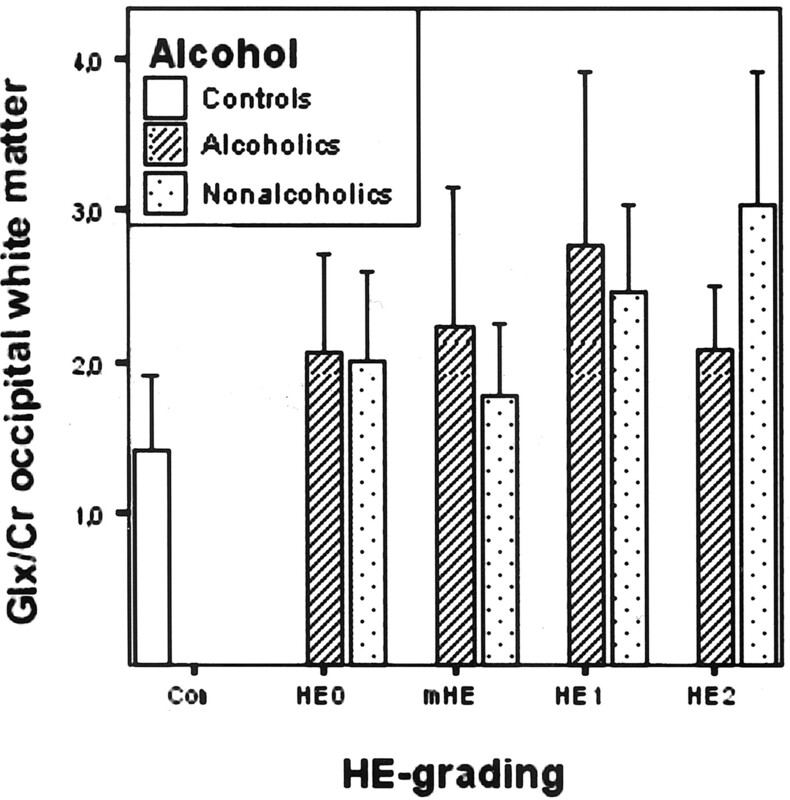 White matter Glx of alcoholics, graded mHE, HE 1, and HE 2 and white matter Glx of nonalcoholics with overt hepatic encephalopathy (HEO) are elevated, compared with that of controls (Co) (P < 0.05; Mann-Whitney U test). In patients with alcoholic cirrhosis mIns/Cr and Cho/Cr of the basal ganglia were decreased significantly, compared with those of controls, whereas Glx/Cr was increased. Correspondingly, in these patients with cirrhosis, mIns/Cr of the white matter was decreased and Glx/Cr was increased significantly (Fig 1). NAA/Cr of the alcoholic subgroup was not significantly different from that of the controls. No correlation between hepatic encephalopathy severity and MR spectroscopy parameters was found in the alcoholic subgroup (Table 3). In nonalcoholic patients with cirrhosis, MTR of the thalamus, pallidum, putamen, caudate nucleus, and occipital white matter was significantly reduced compared with that of controls. MTR of thalamus, pallidum, putamen, and occipital white matter was negatively correlated with the hepatic encephalopathy severity (r = −0.44 up to −0.67; P < .06 up to .002) (Table 2, Fig 2). In the alcoholic subgroup, the MTR of all regions assessed was significantly decreased compared with that of controls. There was no correlation with hepatic encephalopathy severity (Table 3, Fig 2). Graph shows hepatic encephalopathy-grading and occipital white matter MTR in mean values; whiskers show SD. 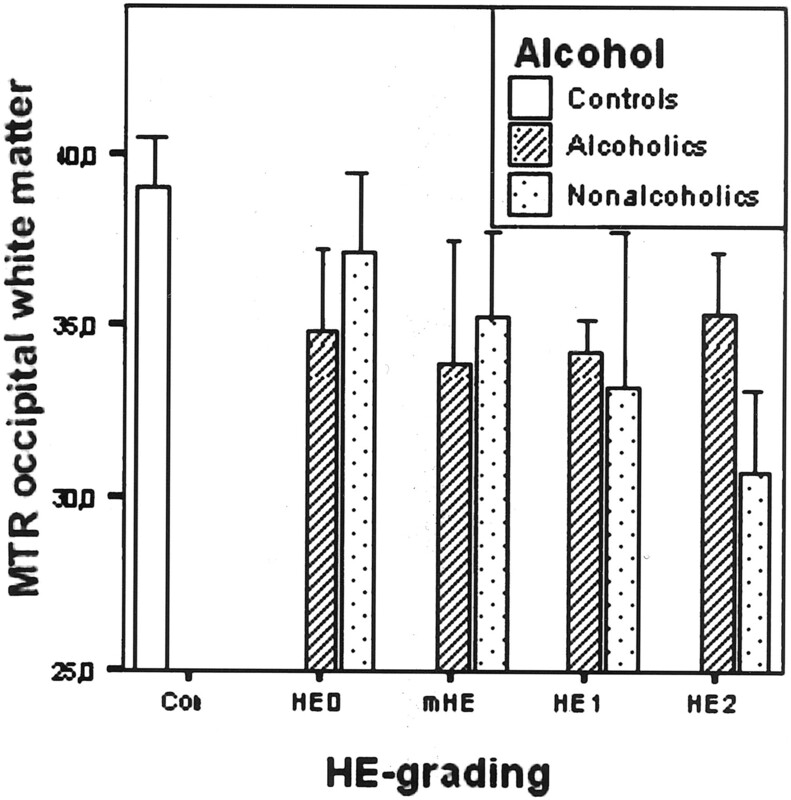 White matter MTR of alcoholics, graded any hepatic encephalopathy, and white matter MTR of nonalcoholics with overt hepatic encephalopathy (HRO) are reduced, compared with that of controls (C0) (P < 0.05; Mann-Whitney U test). ADC was not significantly altered but showed a tendency toward increased values in the thalamus and in NAWM in nonalcoholic patients with overt hepatic encephalopathy. Occipital white matter ADC was higher with increasing hepatic encephalopathy severity (Table 2). In the patients with alcoholic cirrhosis, the ADC of none of the regions examined was significantly different between alcoholic patients with cirrhosis and controls (Table 3). In the subgroup of patients with nonalcoholic cirrhosis, there was a negative correlation between MTR and Glx/Cr of the occipital NAWM (r = −0.68; P < .01; Spearman rank correlation) (Fig 3). There was a positive correlation between MTR and mIns/Cr ratio of the white matter (r = 0.53; P < .05; Spearman rank correlation). Glx/Cr of the NAWM correlated negatively with mIns/Cr (r = −0.62; P < .01; Spearman rank correlation) (Fig 4). In the nonalcoholic patients with cirrhosis, a negative correlation was found between the MTR of the thalamus and the Glx/Cr of the basal ganglia (r = −0.61; P < .01; Spearman rank correlation). The MTR of the thalamus and the mIns/Cr ratio of the basal ganglia showed a positive correlation. A, Nonalcoholics: occipital white matter Glx/Cr and MTR. Graph shows linear regression analysis (r2=0.48) and 95% predictive interval of means. B, Alcoholics: occipital white matter Glx/Cr and MTR. Graph shows linear regression analysis (r2 = 0.07) and 95% predictive interval of means. A, Nonalcoholics: occipital white matter Glx/Cr and mIns/Cr. Graph shows linear regression analysis (r2 = 0.34) and 95% predictive interval of means. B, Alcoholics: occipital white matter Glx/Cr and mIns/Cr. Graph shows linear regression analysis (r2=0.00) and 95% predictive interval of means. In the alcoholic patients with cirrhosis, there was no correlation between white matter MTR and any other white matter parameter. Also, no correlation between white matter Glx and mIns was found. In the basal ganglia, the MTR of the thalamus was weakly negatively correlated to the Glx/Cr ratio (r = −0.41; P < .05; Spearman-rank correlation). There was a negative correlation between NAA/Cr and Glx/Cr in the basal ganglia (r = −0.60; P < .01; Spearman rank correlation). The present study reveals that in patients with liver cirrhosis, MTRs were decreased and ADCs were increased, compared with those of age-matched control subjects without neuropsychologic impairment. Yet there are differences between alcoholic and nonalcoholic subjects. Nonalcoholic patients with cirrhosis showed a pattern of MR imaging findings as previously reported. Briefly, 1H-MR spectroscopy revealed an increase in Glx/Cr and a decrease in the mIns/Cr and Cho/Cr ratio. This finding is considered typical in hepatic encephalopathy1 and suggests that the subgroup of nonalcoholic patients with cirrhosis enrolled in the present study is comparable to groups of patients with cirrhosis studied previously. 1H-MR spectroscopy changes were similar in the basal ganglia and in the occipital white matter, pointing toward changes that affect gray and white matter in a similar manner. Therefore, effects of a systemic cause rather than local influences should be discussed. Because these known changes are interpreted as possibly ammonia-induced, with an effect on osmoregulation and brain-water content, magnetization transfer imaging, which reflects changes in cerebral water content, was performed.11 Corresponding to these previous results, the present study shows a decrease in the MTR of the basal ganglia and occipital NAWM in patients with cirrhosis. However, for the first time, a correlation of MR imaging findings with increasing severity of hepatic encephalopathy as defined by computer psychometry could be demonstrated. The MTR of the thalamus, globus pallidus, putamen, and white matter decreased significantly with increasing severity of hepatic encephalopathy in nonalcoholics. However, in contrast to nonalcoholic patients with cirrhosis, the marked decrease of MTR in alcoholic patients did not correlate with hepatic encephalopathy severity. The decrease in the MTR may be explained by cellular loss and demyelination18–20 or disturbance of brain-water content.11,21 Rovira et al13 demonstrated reversibility of MTR decrease in hepatic encephalopathy following successful liver transplantation, a finding unlikely in the case of axonal loss. The data of the present study indicate that there is neither a decrease of NAA/Cr in nonalcoholic patients nor a correlation between MTR and NAA/Cr, as should be expected in the case of structural alteration of white matter and loss of myelinated fibers. Furthermore, demyelinating lesions in progressive multifocal leukoencephalopathy have been reported to reduce MTR to half of the values found in the control group.22 Compared with these results, the decrease of MTR in hepatic encephalopathy was very mild. Therefore, demyelination seems an unlikely explanation of MTR reduction found in patients with hepatic encephalopathy. A slight increase of brain-water content may, however, result in a relative rarefaction of magnetization transfer sites in relation to free water protons. A possible consequence may be a mild swelling of astrocytes, which has been proposed to be a key factor of hepatic encephalopathy pathogenesis.3,10 Both basal ganglia and occipital white matter show a decrease of MTR in hepatic encephalopathy. Corresponding to 1H-MR spectroscopy, this finding can be interpreted as a result of a general effect on the brain, but this finding may not be explained by an affect on the basal ganglia alone (see Figs 5–7). MR Spectra of posterior NAWM in a healthy control (A, patient 11), a nonalcoholic patient with cirrhosis (B, patient 55) with overt hepatic encephalopathy, and an alcoholic patient with cirrhosis (C, patient 59). Arrows indicate alterations in the patient’s spectrum, compared with that of the control group. Control (A): mIns/Cr, 0.926; NAA/Cr, 1.952; Cho/Cr, 0.301; Glx/Cr, 1.442. Nonalcoholic patient with cirrhosis (B): mIns/Cr, 0.038; NAA/Cr, 2.129; Cho/Cr, 0.255; Glx/Cr, 3.307. Alcoholic patient with cirrhosis (C): mIns/Cr, 0.260; NAA/Cr, 1.722; Cho/Cr, 0.249; Glx/Cr, 1.784. ADC map (width, 400%; center, 200%). A, Healthy volunteer (subject 14). B, Nonalcoholic patient with cirrhosis with HE 2 (subject 47). C, Alcoholic patient with cirrhosis and HE 2 (subject 50). ADC of volunteer (A): thalamus, 73.6; NAWM, 83.3. The following data refer to means of right and left side of the brain. ADC of nonalcoholic patients with cirrhosis (B): thalamus, 87.9; NAWM, 101.4. ADC of alcoholic patients with cirrhosis (C): thalamus, 80.6; NAWM, 108. The assessment of MTR only can hint at alterations in the brain-water content overall. To differentiate intra- and extracellular water content, DWI was performed. A generally accepted model of cytotoxic edema assumes that an increase of intracellular volume (ie, intracellular edema due to a shift of extracellular water) results in an impaired brownian molecular movement in the extracellular space and thus in a decrease of the ADC.23 On the contrary, fluid leaving capillaries in vasogenic-interstitial edema enlarges extracellular space with an increase in ADC. Electron microscopic studies on rat models of fulminant hepatic failure report both cytotoxic and vasogenic edema.29 In this study, swelling of the perivascular astroglial foot process was the predominant finding, accompanied by a dilation of extracellular spaces in the cerebral cortex, pons, basal ganglia, and cerebellar cortex. A postmortem study on human brain material of 9 patients who died from hepatic coma reports comparable morphologic changes.30 In this context, an increase in ADC may point to an extracellular component of low-grade cerebral edema in hepatic encephalopathy, whereas intracellular cytotoxic edema may be present at the same time and is best assessed by magnetization transfer imaging. However, because pathophysiology differs between fulminant hepatic failure and chronic hepatic encephalopathy, this theory awaits further study. Moreover, the slight changes in intra- and extracellular water distribution and in water exchange between compartments that are possibly associated with hepatic encephalopathy may be too subtle to be detected sufficiently by DWI alone, because of its restricted spatial resolution. In contrast to nonalcoholic patients, patients with liver cirrhosis of alcoholic etiology showed no correlation of MR findings with increasing hepatic encephalopathy severity, while exhibiting the same overall changes in 1H-MR spectroscopy and magnetization transfer imaging as those of nonalcoholics. In view of an absent correlation between mIns/Cr and Glx/Cr ratios in the basal ganglia and in the occipital white matter, astrocyte edema with reactive mIns reduction alone may not fully explain the results of the present study. One explanation for the discrepancy between the alcoholic and the nonalcoholic group may be microstructural lesions resulting from chronic abuse of alcohol. A 1H-MR spectroscopy study on frontal lobe NAA loss in detoxified alcoholics ascribed neuronal loss or dysfunction to alcohol-induced oxidative stress.31 These findings may in part explain the differences in 1H-MR spectroscopy results between alcoholics and nonalcoholics in the present study, because the NAA/Cr ratio in the basal ganglia was found to decrease with increasing Glx/Cr, as a possible hint to compromised neuronal integrity in the alcoholic group. Alterations in DWI imaging in the brains of detoxified alcoholics have been reported.32 Microstructural abnormalities (ie, disturbance of axonal integrity and changes in myelination and in water content) were considered to be the morphologic basis of these findings. In alcoholics, neuronal membranes have ethanol-induced fluidity changes, which are subject to tolerance, as was first shown in animal models.33 Membrane ethanol resistance is accompanied by an increased phospholipid turnover, as has been reported for rodents.34 Altered membrane lipid composition, however, may result in changes of magnetization transfer effects.35 Thus, alcohol-tolerant membranes in the brains of alcoholic patients with cirrhosis might exhibit a systematically different magnetization transfer ability than those of nonalcoholic patients with cirrhosis. In the present study, duration of alcohol dependency, lifetime ethanol consumption, and time since the last drink were not recorded. Frontal lobe atrophy and cerebellar NAA and Cho decrease are frequent findings in alcoholics, NAA depletion and atrophy being reversible to some extent.36 Because normalization occurred within the first 3 months of abstinence, assessment of duration of abstinence before imaging might add to the understanding of hepatic encephalopathy in detoxified alcoholic patients. White and gray matter MTR as well as white and gray matter Glx/Cr and mIns/Cr ratios correlated with the neuropsychologic status of nonalcoholic patients with cirrhosis. 1H-MR spectroscopy and magnetization transfer imaging are useful in assessing alterations attributed to changes in cerebral water content and distribution in different stages of hepatic encephalopathy. No such correlation could be shown for alcoholic patients with cirrhosis, who exhibited similar overall alterations in magnetization transfer imaging and 1H-MR spectroscopy. This finding may hint at an interference of alcohol abuse with the pathophysiologic mechanisms perhaps due to direct toxic effects leading to a decrease in MTR and changes in 1H-MR spectroscopy in cirrhosis. Accepted after revision September 20, 2005.